It is clear that the luxury market in the Middle East has entered a new phase of development. An increasingly maturing retail sector, global and regional macro-economic factors, combined with dampened consumer confidence is translating into a market that is growing much slower than before. The personal luxury goods market has enjoyed eight to 10 percent annual growth over the last decade, but is expected to slow down to around four to five percent in the next few years. This obviously puts added pressure on the businesses operating in the market, but also presents them with an opportunity, so long as they are able to rise to the challenge and improve their understanding of local consumers needs and expectations moving forward. With over 60 years experience in the Middle East’s luxury market, Chalhoub Group is a company that knows how to cater to the ever-changing demands of its customers. World Finance caught up with Patrick Chalhoub, Co-CEO of the Chalhoub Group, to find out how the market is changing and what to expect in 2016. What is ‘in’ right now with your customers? The customer is becoming increasingly knowledgeable, demanding and volatile. Thus, we have to offer a real experience, real knowledge and real storytelling. The customer is also less loyal due the variety of choices they have in the market. Our store must become an extension of the home, with large spaces, including private areas, comfortable seating and the legendary Arabic hospitality all being a part of the experience. There is also a need to be digitally enhanced, enabling easy screening of the whole boutique. Customers want to be recognised when stepping into the store; their tastes and needs anticipated. Products will have to be launched in the Gulf at the same time as in the West – to the minute, including special lines for Gulf customers in terms of sizes, cuts, shades and scents, and these will need to be launched exclusively in the Gulf, or at the very least ahead of the global market. Would you say the customer defines the luxury market or businesses such as yours? ‘The Omnivore Horse’ most represented by the markets of Abu Dhabi, Dubai and Jeddah and also more skewed towards females. These consumers have a very strong relationship with fashion as they follow trends, regularly update with new pieces, are on trend through blogs and magazines, and display strong celebrity influence. They associate luxury with things, like spas, gourmet food, furniture, travel, and cars. They will substantially spend in all these categories. In terms of expectations in store they will need it all, from the latest products to store staff expertise. It is crucial to reward these loyal customers with invitations to previews and access to personal stylists. They will display the highest brand awareness and a high conversion to a wide array of brands. ‘The Opinionated Horse’ is mostly found in Doha and mostly male-oriented. For them, being granted special prices comes first, followed by the latest offer, service and of course recognition. It is also about the right appearance, but because it will showcase success. ‘The Conservative Horse’ is mostly seen in Riyadh. For them, fashion is about reassurance. Critical influences will include social media first and foremost. They will additionally need a good dose of reassurance through all types of advertising. They will still be fuelled by the need for reassurance, needing sales staff expertise in the brand and aware of trends as well as recognising them as loyal customers. ‘Gazelles’ view fashion as an expression of effortless style and are quite influenced by celebrities. In terms of expectations in store, Gazelles will need it all: from the latest products, to store staff expertise in the brand and aware of trends, to being recognised as a loyal customer, including invitation to previews and being sent collections at home. ‘Falcons’ are an archetype still very much in its infancy, they somewhat distance themselves from the materialistic world and are beginning to appreciate luxury for the experiences and the enjoyment it can bring. In–store they seek knowledge of the brand’s history and heritage as well as deep understanding of how the product is made. The sales staff must become storytellers, helping them immerse themselves in the very essence of the brand. In terms of products, the falcons will be attracted to bespoke and ‘made to measure’ items. In terms of events, intimacy is paramount. At Chalhoub Group, we believe that by understanding our consumers and their behaviours we will be able to cater to their needs and aspirations, and offer them the best in service and a unique experience. What trends do you see in the luxury market? The quest for immaterial value – the experience behind the product is one of them. This search will obviously translate in store with more augmented realities, 360 approaches and store staff as storytellers. Another trend we call is ‘centre of the world’; as regional fashion weeks blossom and hosting of international events develop (World Expo in Dubai 2020, World Cup in Qatar 2022 for example), the region will want to be recognised not only as a rich territory for luxury consumption, but also for creation of concepts, brands and products. How has the market evolved in the Middle East? The retail sector of the region has seen a shift from souks in the 1960s to distributors stores in the 1980s. In the 1990s the mono-brands started to settle through franchises. At the end of the 2010 we saw the arrival of the international department stores. Today, the consumer is looking for width and depth in the choices, therefore, the return of the multi-brand specialty stores with a more specialised offer. As the leading partner for luxury across the Middle East and a major player in the sectors of beauty, fashion and gifts for the past 60 years, we are very excited to have been able to lead this retail evolution in the region and be able to support our partner brands in their development and growth. How do you see it developing in the future? Technological innovation is becoming critical in the luxury sectors. Consumers are expecting a deep engagement with the brands, wherever they are, whenever they want and anytime they want. Beyond technological innovation, innovation in luxury products are also becoming fundamental in the region. Consumers and millennials in particular are starting to look at luxury brands beyond the logo, for the product itself, which needs to be adapted for their needs. WOW is the group’s private label in make-up. It is the first line of make-up developed especially for the Middle East consumers, with particularities (for example heat resistance) adapted for the consumers in the region. What is the aim of your new speciality store Tryano? The Middle East customer is young and increasingly knowledgeable. A few years ago they needed reassurance and considerable advice, whereas today they are becoming more and more knowledgeable and assertive. They need not only access to the brand and depth of their range, but also the choice among different brands, which they will more easily find in department and specialty stores. Furthermore, the Abu Dhabi market has grown quite tremendously with the direct implementation of some of the franchise brands, but is definitely lacking in specialty and department stores. 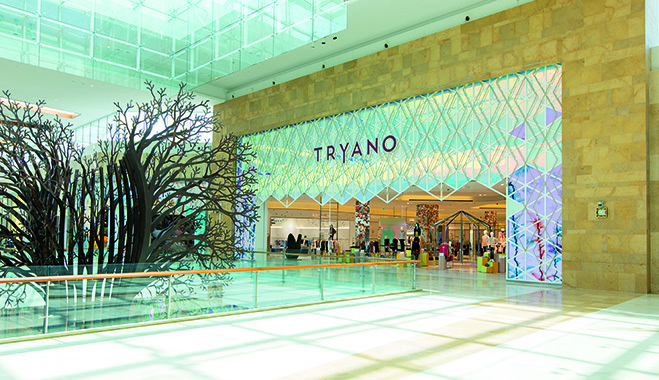 The opening of Yas Mall with a size, choice and variety of stores need to be anchored by a specialty store that offers the luxury aspirational products, which the group is introducing with Tryano. We expect Tryano to be an enchanting garden, extremely alive, entertaining and very specialised in the three categories: bags, kids and beauty, with a remarkable experience for all our guests. Another concept store is planned to open its doors in the first quarter of 2016. It will be the first children’s destination in the region, and will include childrens wear, shoes, accessories, toys, specialised services and will be targeting children aged 0-14 years old, with a focus on children from 0-6 years old. We are also planning to conceive and launch a brand for Oriental Fragrances.